This year 40+ bands will be featured, including the most critically acclaimed emerging artists from around the country, playing bluegrass, Americana, folk, country, and more. Headliners include Scythian, The Black Lillies, Mipso, Humming House, Socks in the Frying Pan, Marie Miller, The Accidentals, Lowland Hum, and Six-String Soldiers. There is on-site camping, horseback riding, mini-golf and a fishing pond. The festival offers discounts for active duty military, and veterans; while children under 13 are free. 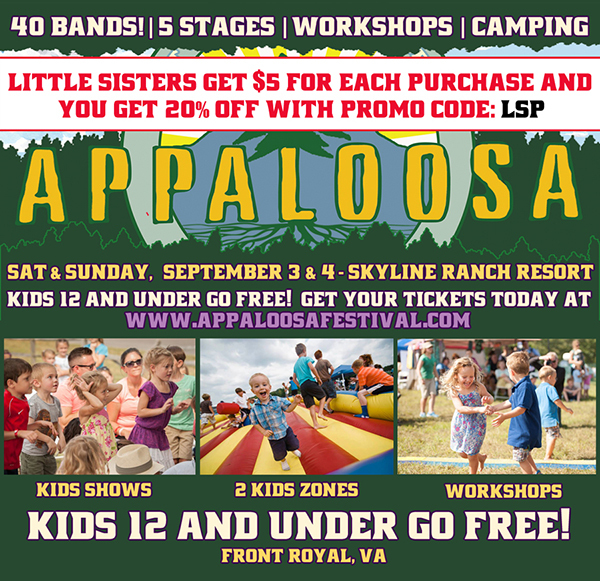 Appaloosa will have a playground, petting zoo, and games available for youngsters, in addition to children’s performers.